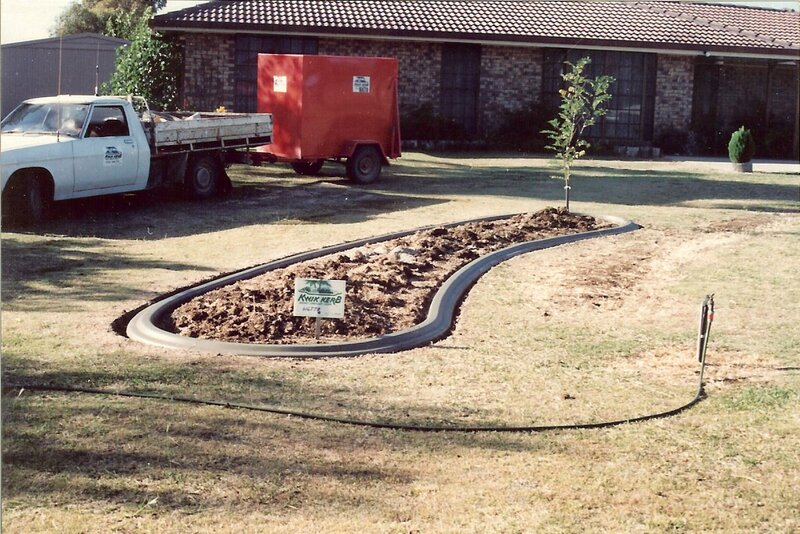 With over 28 years experience in the concrete curbing business we have a lot to offer any property owner wanting to improve the appearance of their landscaping quickly and at very reasonable cost. Let us tell you a little about our experience with machine laid concrete landscape curbing. We first came across the extruded curb business in 1987 and shortly afterwards purchased a Kwik Kerb business and began installing concrete curb as a Kwik Kerb operator in Warwick Qld Australia. 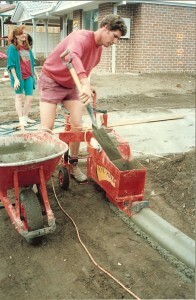 After 4 years as an installer of the Kwik Kerb concrete edge product I was encouraged by the owner of Kwik Kerb to join the parent company in sales and we moved our family to Brisbane in 1992 to join the company. It was there that my engineering talents were also employed by Kwik Kerb as I was engaged initially to improve the design of their machines and subsequently to improve the machine manufacturing and production systems, as I also learned to manage the Kwik Kerb sales team. The original Kwik Kerb system Sheralyn and I owned 25 years ago. During this period in the early 90’s I also spent a lot of free time in R & D of curbing and invented and then perfected the process of stamping curb with multiple colors using release powders, special tools and polyurethane stamping mats. I developed the tools and the system and adapted it for curbing using techniques already long in use for pattern stamping flat-work in Australia. With the Kwik Kerb edging product and tooling perfected and curb installation system proven, I began teaching this brand new method to operators all over the world and this product today is referred to by Kwik Kerb as EuroStyle. (I remember my wife Sheralyn and I searching many landscapes yards around Brisbane for the perfect piece of slate to take a casting for the slate impression mat still in use by Kwik Kerb to this day.) My method of stamping has since been copied by many other people and various versions are now in common use by other companies through-out the world. During my time with Kwik Kerb I had a keen interest in improving the Edgemaster curb machines and designing new curbing tools and techniques to create special and unique border finishes. It was my previous experience in engineering that allowed me to add many innovations to the Edgemaster to make it easier to use and invent the tooling for the Kwik Kerb Euro Brick product. Using my knowledge of the properties of specialized metals I designed unique tooling to facilitate the fast creation of a very authentic looking brick and mortar curbing. The Kwik Kerb company subsequently filed a patent on my invention and we sold the new curbing product as Kwik Kerb EuroBrick. I also instigated the manufacture of the Edgemaster machines in a corrosion proof metal due to my knowledge of high Chromium nickel steels. This development was named GARP. 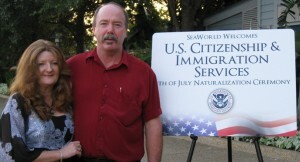 My time working with the Kwik Kerb parent company lasted over 20 years – as in 1999 I moved my family from Australia to the USA and opened the first Kwik Kerb office in USA in Orlando. My position with the US company was initially COO and later President, but I fulfilled many roles including the development of operator training manuals, sales operation manuals, training of hundreds of new business owners, design and development of new products, marketing and sales management and I was the main person worldwide to troubleshoot customer problems and complaints. With sales of the Kwik Kerb systems growing steadily, we expanded the company to bigger premises as we first moved the office from Altamonte Springs to Lake Mary and then in 2005 to its current location in Sanford FL. The huge downturn in the economy starting in 2006 became a real problem for Kwik Kerb as the business relied heavily on the co-operation of lending institutions to finance new business buyers. With few customers having enough capital to purchase new Kwik Kerb systems, I resorted to a strategy of purchasing used equipment, re-furbishing it and selling these used curbing systems at more affordable prices. This strategy was a success in keeping the business viable during these tough recession years until late in 2012 when the company could no longer afford to pay me. We finally parted company with Kwik Kerb and started our own Decorative Edge installation business. 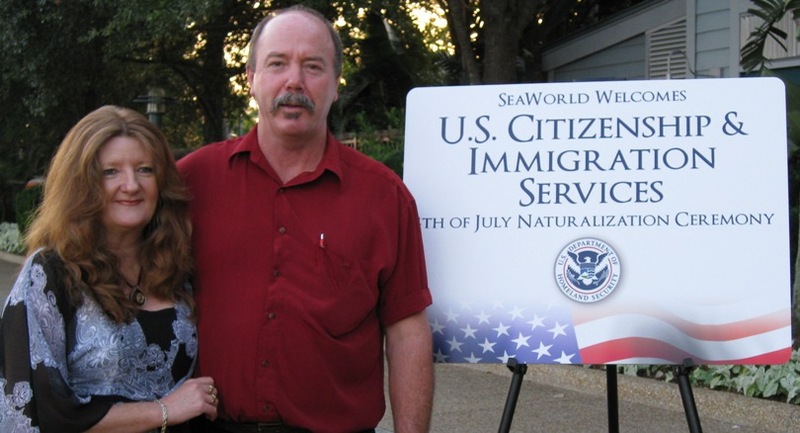 It takes us back 25 years to when we first started curbing – as my wife and I became naturalized US citizens in 2010 and both my sons Jamie and Nathan found their life partners leaving Sheralyn and I as empty-nesters. That’s where we have come from and now we are finally in a place where the vast knowledge and experience I have in the curbing business can be used to provide you with the best Decorative Edging product available in the world today. If your property needs a landscape makeover – If you want to increase the “curb appeal” of your home, or if you are just wanting to add lots of value to your property without breaking the bank – then you’ve come to the right place. Sheralyn and I will provide you with service second to none. We will visit your property initially to offer advice, suggest which products and colors might work best for you and provide a no nonsense and sensible price quote. If you like us and contract us to do the Decorative Edging project, you will receive a signed agreement from us, pay us a deposit and we will set a date for installation. 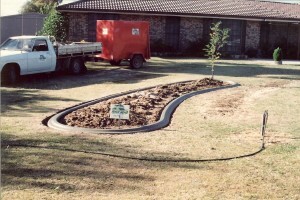 On the installation day you will see your landscape transformed with beautiful curbing framing your beds. We provide an optional annual followup service (at no charge for the first year) and at a nominal fee annually to ensure your landscape curbing remains pristine. We are “fair dinkum aussie battlers” (You might want to Google that.) 🙂 and we do what we say we’ll do. 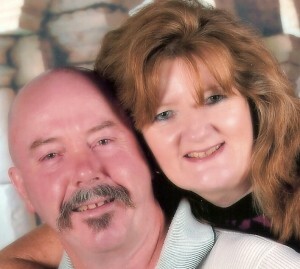 Sheralyn and I look forward to hearing from you. Contact us! You won’t be disappointed.